Last spring when I was browsing a garden center, I came across a blue hubbard squash start. I wasn't sure what blue hubbard squash was, but seeing on the tag it was an heirloom, I decided to give it a shot. The plant I brought home was kind of spindly looking, but as summer progressed it slowly started to take off. Eventually, it had a bulbous green squash growing. I had to google the plant to find out more. Turns out you harvest when the vines start to die. Well, I had no idea that this squash was going to be BIG by the time the vines died back. It didn't turn blue until a few weeks before harvest time. So you use the blue hubbard squash just like you would a pumpkin. I weighed this squash (I actually got a couple from the plant I put in) and it was 20 lbs. 12 ounces. It was a proud gardening moment. So what we did was hack into the squash with a butcher knife. Inside, it is similar to pumpkin. It smelled wonderful. I scooped out the seeds, saving some for next year. You can roast the seeds too, but we did not do this. I cut a bunch of large 6 inch sized chunks, put them on a baking sheet, and baked them for an hour at 375*. I let them cool and then scooped out the flesh into a mixer and pureed it. It made a wonderfully smooth puree. I put it into freezer bags in 2 cup portions, and immediately made a delicious pumpkin bread using blue hubbard squash puree instead of the pumpkin. In all, I got 14 cups of squash puree for the freezer. And an extra large helping of squash rind for my compost bin. And I still have to harvest the other blue hubbards! Win win! I'll be planting this in the garden again for next year. Readers, have you ever seen a blue hubbard? Nice gardening on something new and different. Wow, what a huge, alien-looking thing. Maybe NASA would put it on the list of stuff to grow on Mars! I have had to use a hatchet to open these. This always wins the largest squash at the fair. I like it as a side dish with gravy .They keep forever. Blue Hubbard is my absolute favorite squash! My mom used to grow them, and I have grown them a couple times - although they take an awful lot of space on my tiny urban homestead. These squash store wonderfully - at least 6 months. This is the squash we have every year for Thanksgiving. And we open ours by smashing them in the driveway :-) It was always fun to drop them off our deck growing up to get them open! I have never seen or heard of that squash. Very unusual looking and from what you said, useful in many ways. I have to show my hubby and tell him about them, because, being the 'old farmer' he is, he will have to have some seeds. Thanks for sharing. 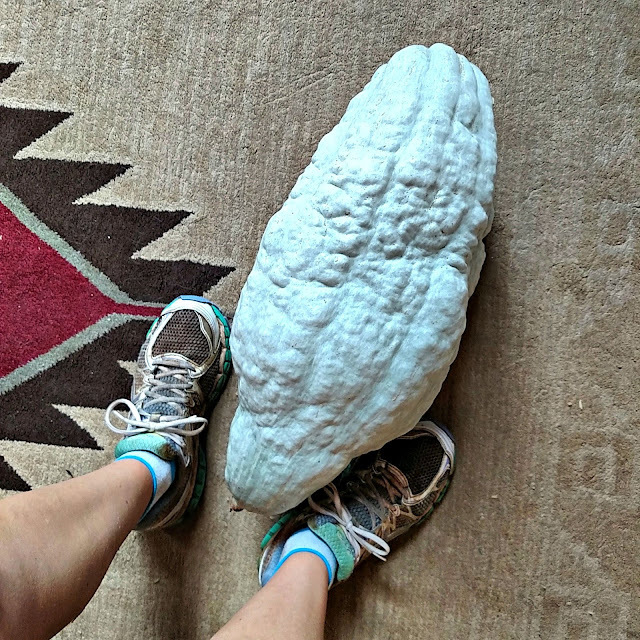 I cannot believe how big that Blue Hubbard Squash is! So you used it in pumpkin bread. Is it similar in flavor as using pumpkin? I'm very impressed! I planted these in these in my garden this year too! Mine came from a seed packet with a bunch of different kinds of heirloom squash. It's been fun to see what they all turned out like and to grow something new. We ate some hubbards when they were small and the texture was like Avocado. Made it into salsa. And I've already picked some of the really big ones and used them for fall decorations. The vines are still going strong here. I have grown these too, I really like them as well! My vines took over a huge space lol. I wasn't expecting that the first time I grew them LOL. That is one mega squash there. I think I need to try growing that variety next year!!! I never have, but I love squash. I know I'd like this variety to. I am looking forward to growing them next year, they look really good. 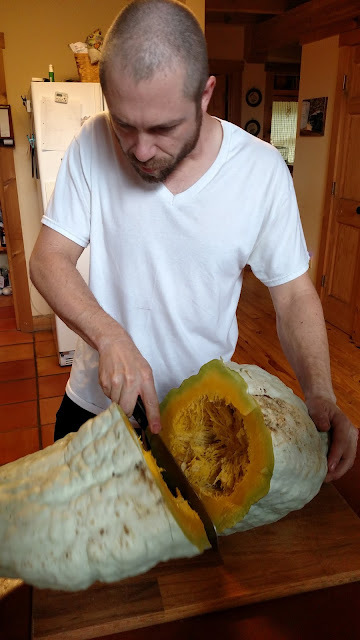 Someone gave me seeds one year and they grew but had a flat smooth skin squash that looked like the color of butternut so I suspect that the seed got crossed some how. Wow, I've never seen one! Strange but wonderful. These are delicious and nice to see that you took a chance on an heirloom. Cool! I have never seen anything like that. I don't think I would have been brave enough to eat it! We have never seen anything like that!!! Oh but it must smell good to cook it. Now that is really something! I've never seen anything like this at all, nor so huge. How wonderful that one plant gave you so much! Congrats to you! Wow - that is one huge squash!! That is huge, but no, I've never seen one before this post. So unusual! I have never seen before. I love your delicious recipes, Lisa!! You have The Best Garden Adventures!